We have just seen the wrap up of the widely successful 2nd Annual Darwin Street Art Festival, held from the 6th – 16th September. The Darwin Street Art Festival is just one of the initiatives of the Territory Government’s investment into cultural activities and the arts in a bid to promote NT as a world-class tourist and cultural destination. It aims to promote Darwin as a vibrant, emerging city and increase the perception of Darwin as a highly desirable tourism destination. The Darwin Street Art Festival brings art to the laneways in an effort to revitalise the Darwin CBD by adding a touch of cultural vibrancy and flair. 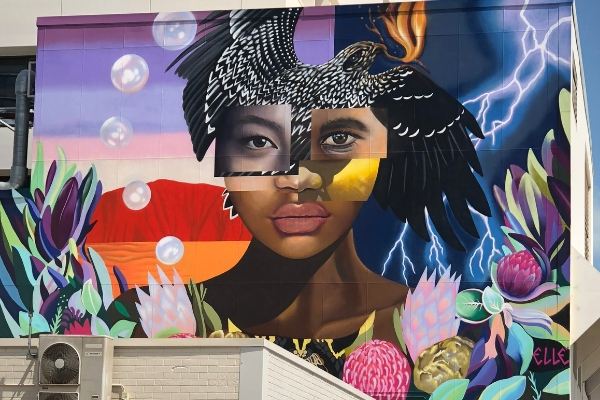 Launched in 2017, the Festival’s first year saw 8 murals painted by local and interstate artists in the CBD. Fast forward a year, and 2018’s festival saw this number increase to 16 murals painted over 10 days by artists from around the globe. West Lane and Austin Lane were highlights throughout the festival, with many works focused on this key tourist area, converting Darwin into a city that rivals the cultural capitals of the world. Added to the spectacle throughout the streets, the festival included drop-in art workshops and loads of family-friendly entertainment. Add this to the existing shops, cafes and restaurants and Darwin was buzzing with life. Artists featuring works in this year’s festival included Carla Russo,Ryan Medlicott, Polly Johnstone, Jason Lee, Vincent Poke, Reice Ranson, Jesse Bell, Georgia Rose, Sole Veins, Phine and Shaun Lee. With the raging success of the festival for two years running, we can only hope to see the festival grow even bigger and brighter in the years to come. We have included some of our favourite works from the festival. For more information check out For more information go to www.darwinstreetartfestival.com.au and check out their instagram.